Goal: Let’s build a 112-core 1.2GHz A53 cluster with 56GB of DDR3 RAM and 584GiB of high-availability distributed file storage, all using at most 200W of power. two weeks and a morning to calculate the correlations between all unique symbol pairs. It’s by far more doable than brute-forcing a SHA256 collision (forget about it), but the markets will have well moved on by then. Can we do better? Let’s scale the problem horizontally: add more processors. just half a day. That’s much better than two weeks. We can do better by not performing all-pairs on all pairs. 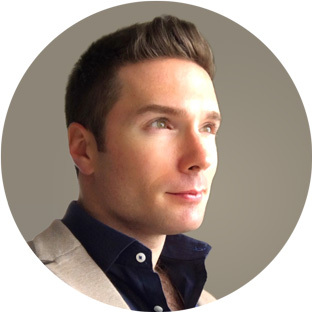 We could ignore OTC/Pinx stocks and most NASDAQI indexes (see this article). Then we have on the order of 20,000-choose-2 pairs which is about 200 million pairs, which would take 2.3 days on one machine, or less than a couple hours on our ideal cluster. Now we’re talking. Cluster computing makes sense so far. Cluster computing with 27 processors can reduce the job time from a couple weeks to half a day, to even just a couple hours with optimizations. 2. Infrastructure: AWS/Google Cloud or Physical Hardware? I was at the Google Cloud OnBoard convention in Vancouver in September this year2 and in an effort to asses cost I stood up and asked a question: Would it be better to do, say, crypto mining using Google Cloud resources, or on an equivalent on-prem hardware setup? There were five GCEs (Google Cloud Engineers) on the stage answering questions at the time, and they paused, looked at each other, then lightly chuckled. The response was that cloud compute was not meant for flat-out processing, but that they would gladly take payment. How expensive would a comparable 28-CPU rig cost per month with Google? Google does not allow a 2:1 cores-to-RAM configuration, so I used a 1:1 ratio in the base calculations. From the last two pricing calculations, it looks like 56 GB of RAM is about $86/mo over two instances. 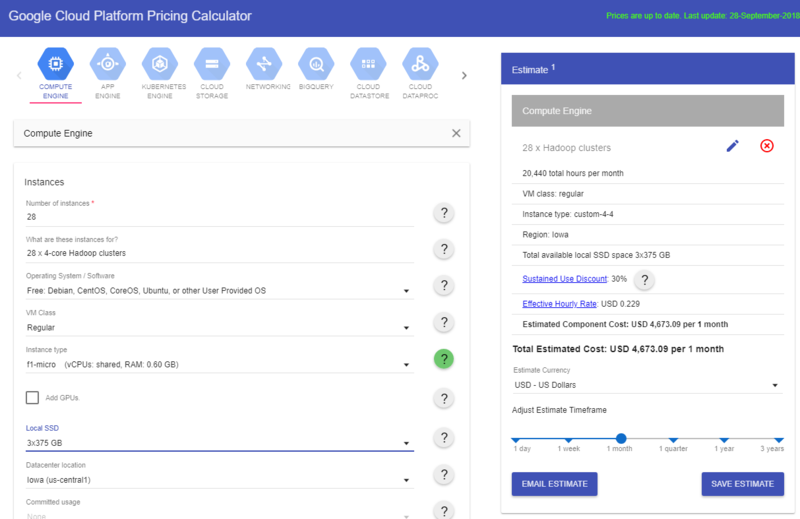 The same hardware we are building on-prem as we can spec out on Google Cloud will equivalently cost between $301 and $1,767 USD per month. The lowest we can pay, however, is USD $753 per month. How expensive would a comparable 28-CPU rig cost per month with Amazon? The same hardware we are building on-prem as we can spec out on Amazon AWS Cloud will equivalently cost between $117 and $181 USD per month. The lowest we can pay, however, is about USD $292 per month. On paper, a performance-adjusted 112-core cluster in the cloud is worth between $117 and $301 USD per month, and will cost between $292 and $753 USD per month. But of course this not the end of the story. This looks good on paper, but what can you do with a cloud node that only has 1 GB of RAM, or even just 0.5 GB of RAM? That’s akin to using networked Raspberry Pi Zeros in the cloud. Remember, the hardware I’m building uses 2 GB of DDR3 RAM per node. Also, the vCPUs are still shared with other tenants. Finally, network costs were not included at all. I’ve omitted hundreds of gigabytes per month of I/O traffic that will drive the costs highers. It is much better economic value to build a hardware compute cluster and run it on-prem than to use equivalent cloud infrastructure. Going in I have no idea what cluster compute framework or even languages I will use, but they will either be R or Java, and some kind of Hadoop or Apache Spark stack. I just want to build a box with a lot of wires and LAN cables, and blinking lights for the win. Just kidding. There are important design considerations. For the all-pairs problem, we’re going to need manpower over horsepower, and that means more cores with enough RAM available per core. Analyzing time series data is not so processor intensive, but there are thousands of stock symbols to analyze in parallel. Which processor (and SBC or SoC10) to use? Let’s compare. Here is a condensed table from my larger spreadsheet. PPC is “Price per Core”, and PPCxR is “Price per Core-times-RAM”. All RAM is (LP)DDR311, and all boards have a microSD slot and true Gigabit Ethernet capability12. Prices in USD. Out of all these performant single-board computers, the SOPINE module has the lowest price per core, and second lowest price per core-GB-RAM. The next closest is the ODROID XU4, but with 8 cores sharing 2GB of RAM, there is going to be more pagefile swapping which we must avoid at all costs. That is another reason why the 16-core Parallella board is out (it is suited for low-memory tasks like parallel password guessing). Some boards have internal eMMC storage, which is nice, but they can not be upgraded, so in a couple years we will run out of storage (more on that later). 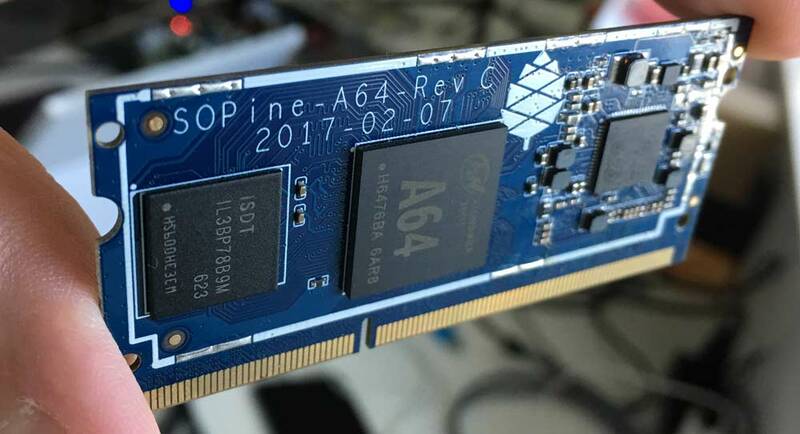 The SOPINE A64 is a SODIMM-DDR3 form factor compute module by Pine64. It has just the Allwinner Cortex A53 1.2GHz quad-core 64-bit ARM processor (with Mali400 MP2 GPU), 2GB of LPDDR3 RAM, SPI Flash, a microSD slot and a MALI2 GPU. The manufacturer has long-term support for these modules until 2022. This module lends itself to space savings as there are no USB or HDMI connectors. We’ll be powering the compute cluster with twenty-eight SOPINE A64 compute modules. Now that we are moving forward the SOPINE A64 modules, let’s decide on how to architect our distributed storage. The SOPINE modules have a microSD card slot and a USB 2.0 bus. For now let’s proceed with a microSD solution on paper. At this time Class 10 are the best, so we are going to use Class 10 cards rated for 10MB/s sequential write, and a higher read speed. Why not have all the big data on an SSD and shuttle it to the compute modules through the GbE network? With 28 modules (more on this number in a moment), and a NAS network best-bandwidth of 125MiB/s, each module can access only 4.46MiB/s. That’s less than half the sequential read speed of the Class 10 microSD cards. Also, at this time 32GB Class 10 U1 microSD cards are reasonably priced and they are easy to replace when they fail (more on redundancy soon). Let’s plan on using Class 10 (minimum 10MB/s sequential write, >10MB/s sequential read) U1 microSD cards in each of the SOPINE compute modules. 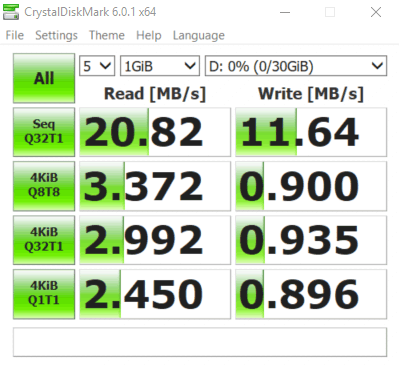 Update: I went into detailed benchmarking of microSD cards and USB 2.0 flash storage, and it turns out random read and write speeds differ considerably between devices. We’ll actually be using A113 or A2 cards, not vanilla Class 10 cards. 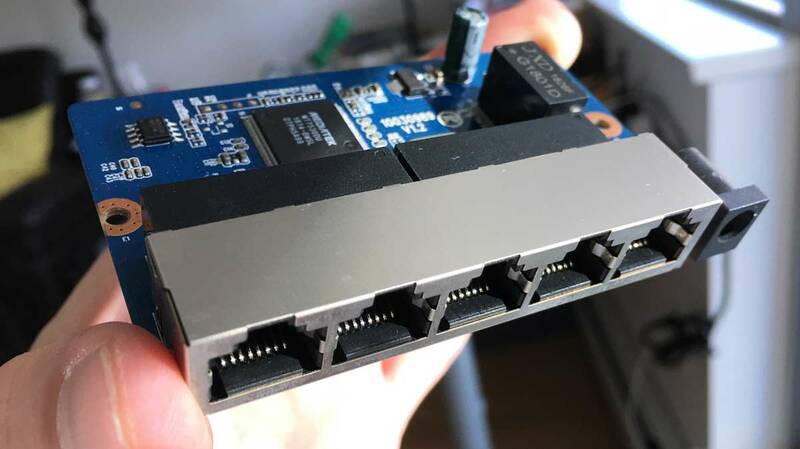 Pine64 makes a cluster board that holds seven SOPINE modules and has on-board power management and an 8-port Gigabit Realtek switch chip with a 16 gigabit backplane. It also provides USB 2.0 ports and header pins beside each module. 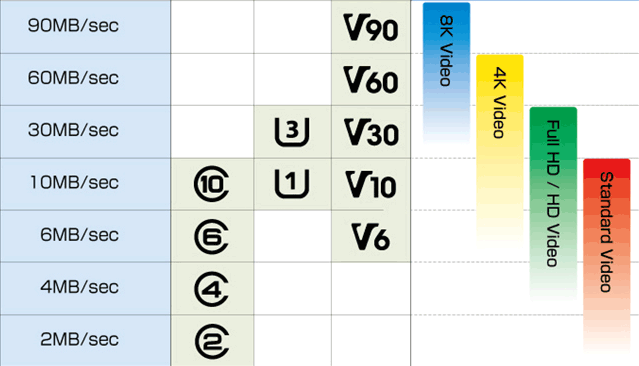 Importantly, the cluster board minimizes the use of LAN cables that would otherwise be needed to network 28 SBCs. 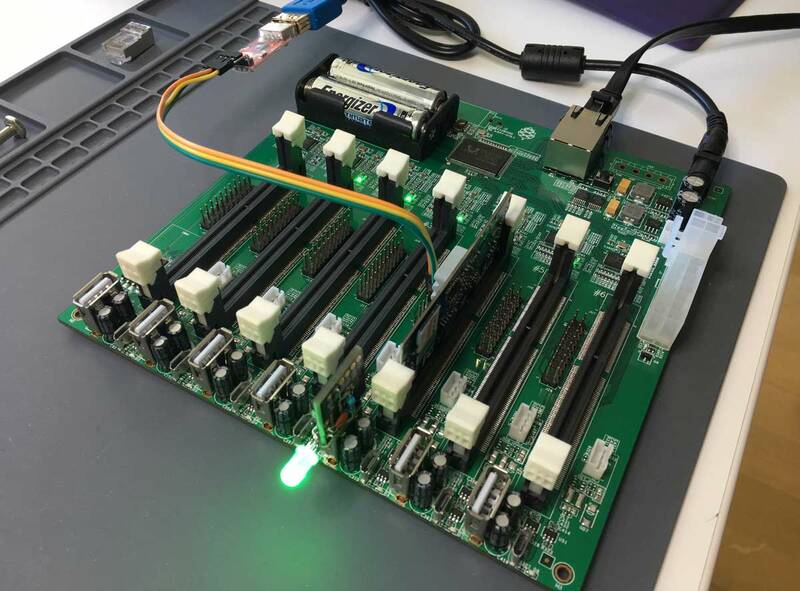 Let’s be adventurous and use four cluster boards with seven SOPINE modules each, or 28 compute modules for a total of 56 GB of RAM and 112 cores. There is a sense of pride going past 100 cores, don’t you think? Actually, with four boards we’d only need a 5-port switch (GbE with 10Gb/s backplane capacity) to network them, plus they stack nicely into a cubic volume. Additionally, using four boards is the sweet spot with respect to power utilization (more on that below). We’ll be building a 112-core compute cluster with 56GB of DDR3 RAM with four SOPINE cluster boards and twenty-eight SOPINE compute modules. How well can we do with, say, twenty-eight 32GB microSD cards? You’d be forgiven for thinking you’d have 896GB system capacity. You’d really have a third of that, or about 300 GB, which is more like 292 GiB, because HDFS14 has a default replication factor of 3. That’s why the microSD cards can be replaced easily when they eventually wear out without downtime or loss of data. Is 292 GiB sufficient? At the time of this article my store of securities data is 90GiB uncompressed and it is growing by 72GiB per year. That gives us a couple years to see if the price of storage drops enough to warrant an upgrade. Nice. Why not 64GB cards? At this time there is a generous price break for 32GB cards from several manufacturers, probably because snap-happy smartphone users (such as myself) require more storage than 32GB, so 64GB cards still have a lot of demand and are priced as such. The cluster will boast an effective high-availability storage of 292GiB using twenty-eight 32GB Class-10 microSD cards. Update: 128GB cards are in high demand now, so 64GB A113 microSD cards have come down in price. The new plan is to have 584 GiB of redundant, distributed storage for big-data operations. I’m told each SOPINE module may use up to 6W at peak utilization. At 5V, 6W is 1.2A. Then 1.2A times 7 modules is 8.4A per cluster board. With four cluster boards that is 33.6A. When the 5-port switch and the 4×8-port switch chips are included, that could be up around 40A! There are 200W power supplies that can handle this load. But, adding a fifth board would require a new switch, and much bigger power supply (the next biggest power supply up is typically 350W). Power wise, four cluster boards is the sweet spot. We will be using a 200W, 5V power supply to power the twenty-eight SOPINE compute modules and internal networking. This is a better explanation of why we are not using a NAS SSD to supply data to each compute module: it would be far too slow. Granted, 20MiB/s sequential read speed is not great, but with optimizations such as caching the most frequently used stock symbols we should be able to reduce the IO penalty. This is where a distributed file system like Hadoop HDFS + Apache Spark shines: compute operations are sent to the data, not the other way around. Let’s be sure to use Cat6 or Cat6a STP16 cable (rated for 10Gbps) to connect the cluster boards to the network switch. Just do not use Cat5 cable (rated for only 100Mbps). Cat5e cable is rated for 1Gbps, so it should theoretically be okay. I’ll actually be using Cat6 STP cable. 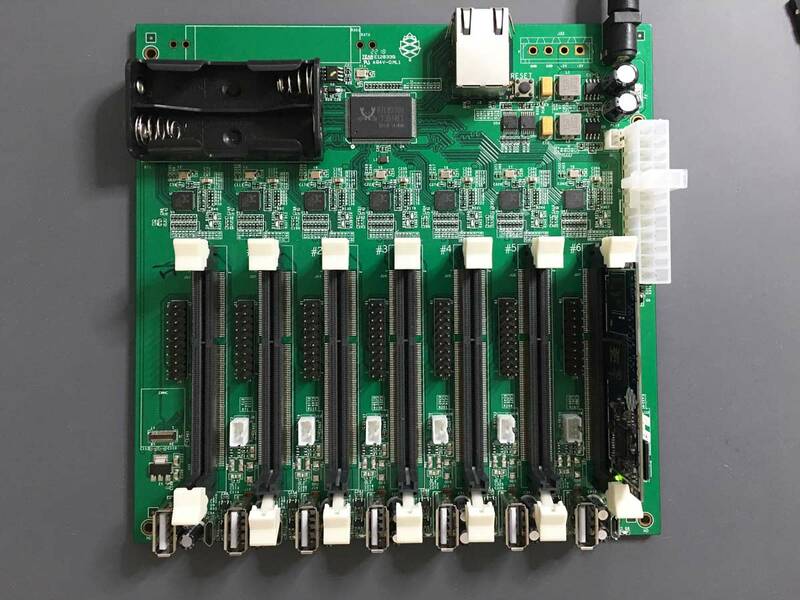 Each cluster board can communicate with a neighboring cluster board at Gigabit speeds, and each SOPINE module can also communicate with a neighboring SOPINE module at Gigabit speeds. When all distributed storage is “drained” for backup, the speed will again be Gigabit speeds. These compute modules are going to get hot! Right away we are going to need passive heatsinks. I’ve researched and settled on low-profile aluminum-oxide ceramic heatsinks because they outperform metal heatsinks due to their increased surface area due to micro pits. They need to be low profile because I will need access to the header pins beside the SOPINEs. The SOPINE modules will need to be actively cooled as well. They get hot, up to 70°C I’ve found, so adequate airflow is required. 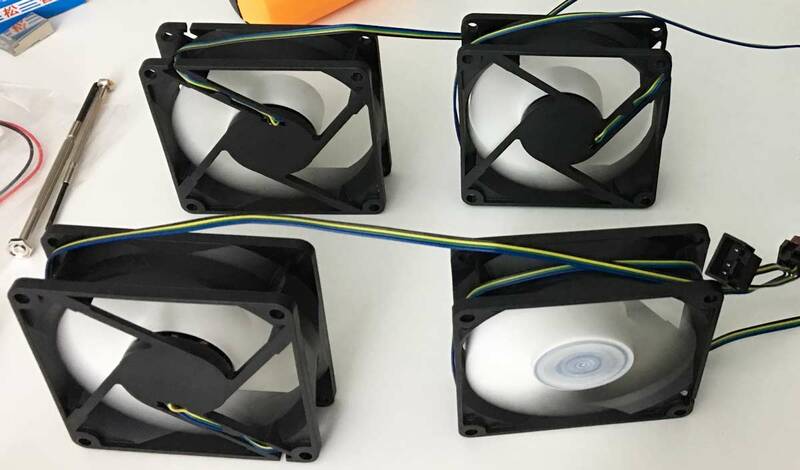 I want this cluster to be ninja quiet, so after a lot of research into fans, I settled on ultra-quiet Arctic Air fans. 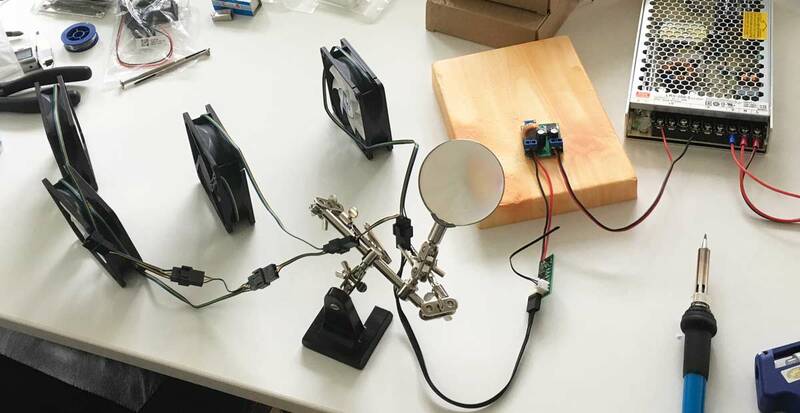 They are 12V PWM fans, so a boost converter will be needed to increase the voltage from the PSU from 5V to 12V. The current should be low, less than 1 amp, so that is why I chose to boost the fan voltage up to 12V, not buck the clusterboard voltage down to 5V from a 12V power supply. A PWM fan controller is a nice touch too. 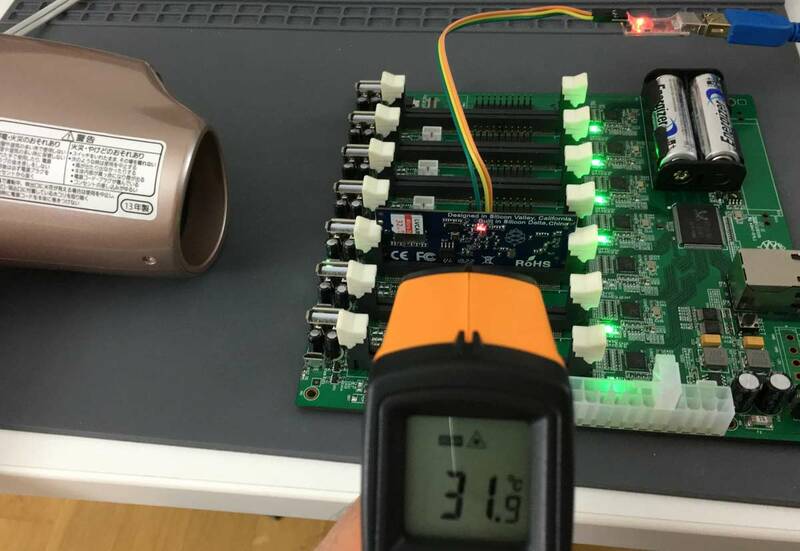 Update: I ordered and tried three efficient (>85% efficiency) 5V-to-12V boost converters to supply just under 1A of fan cooling but they all got extremely hot – one reached 83°C, and one is known to catch on fire! I’m now using a proper 12V switching power supply alongside the 5V switching supply with zero heat issues. 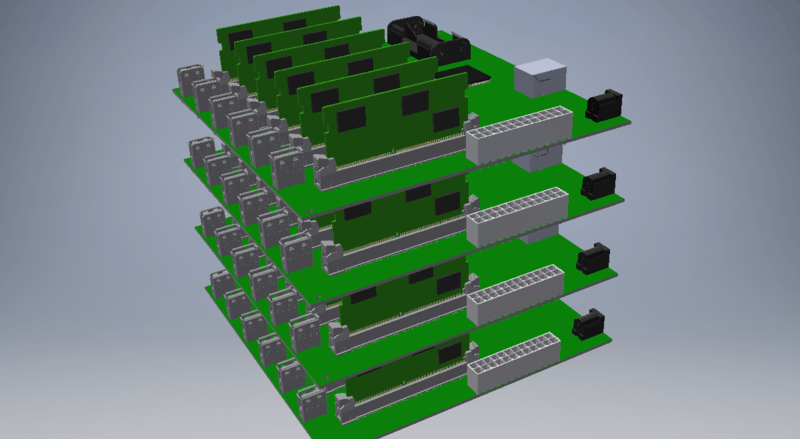 The biggest design considerations have been settled, so the plan now is to physically design and build this compact, and performant compute cluster. As a preview of things to come, the final enclosure is estimated to occupy a volume of only 24cm x 24cm x 24cm which you can hold in your open palm. For my next point of research, I will delve into performance measurements of the SOPINE A64 modules with the Phoronix Test Suite, as well as test the microSD cards, power supply, boost converter(s), PWM controllers, SOPINE thermal properties, and power consumption.